Mention WWI and TV series together and you will get my full attention. 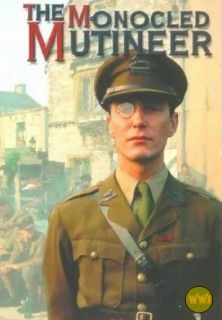 I had never heard of the four part BBC series The Monocled Mutineer before ordering another WWI movie and seeing this one mentioned as well. I’m particularly keen on movies on WWI and generally fond of made for TV productions. Plus reading how much controversy this show created, making it the most controversial British show ever, I was even keener on watching it. It has not been shown on TV again since its first and last airing in 1986. Pretty astonishing. Here is a review from IMDb by a user named dunkah. The reason this drama has not been repeated is that after the first broadcast the BBC came under fire from the government and were banned from screening it again. This was due to the sensitivity of the subject matter, i.e. Percy Toplis and the mutiny at “The Bull Ring”, a harsh British Army training ground in Etaples, France. There is a lot of mist around Percy Toplis who was finally tracked down and killed some years after the end of the war. No one truly knows the events that transpired at the Bull Ring for certain and we won’t know until 2017 when the files on the event will finally be released. Until then all we have is this drama and I think there should be a demand that it should be broadcast again, some 18 years on. The series starts with the shooting of Toplis that’s why the quote above isn’t a spoiler. It then rewinds and tells his whole story from his childhood, to the trenches and from there to the forest and finally back to England. Toplis (Paul McGann) comes from a modest background, a mining town. Being a miner is not the type of occupation he sees himself in. From his early childhood on he figures he is better than his working class upbringing. Delinquent at a young age, he spends time in prison and finally when WWI breaks out he joins up. At first he’s doing his bit as cannon fodder but he’s the insubordinate type and gets into trouble more than once. Still he survives several offensives and while not keen on danger and the trenches, he isn’t bothered too much. What bothers him is the way he is treated and the way the officers treat his comrades. He witnesses executions for no other reason than fear in battle. He observes cruelty and sadistic behaviour. But not only abuse infuriates him, it’s also clear that the British high command makes many bad decisions which cost lives. Toplis is a tall and very handsome man and he is capable of speaking like and officer. This gives him the opportunity to live the life of an officer in the evenings. With a stolen uniform and pretending to be of high rank, all the doors are open. When he’s finally had enough, he deserts and lives with a bunch of other deserters from different countries. They instigate a mutiny and create quite a commotion. Although many people are involved in these acts of insubordination it’s finally Toplis who is the most wanted man. I can understand why there was reluctance to show this series again. Despite the fact that it has very slow moments, it’s excellent and I’ve hardly ever seen a British production in which the officers and high command were criticized like this. Watching this made me really furious more than once. Pair incompetence with arrogance and you will have a total disaster. The way the officers treated the soldiers was appalling. No respect whatsoever for the so-called lower classes. Toplis is a fascinating character. He isn’t exactly a likable man, he cheats and lies and betrays wherever he can and very probably if he had been born noble he wouldn’t have cared much about those below himself. His character just exemplifies that all it took to pass for an officer was a uniform, manners and a certain size. He is one of those charcaters we usually find in novels. There are many like him in literture, Felix Krull, Bel-Ami, to name but two. As I said before it has a few slow moments, still it’s highly watchable and interesting. This entry was posted in True Story, TV Series, War Movie, WWI and tagged BBC Series, Paul McGann, Percy Toplis, Review, True Story, War Movie, WWI. Very interesting. I did some research since I had never heard of this guy. Toplis is very controversial as is the series. (It is pushing it to call it a “true story”.) Basically what I found indicates the series is very loosely based on the truth. For instance, it is highly unlikely he was involved in the mutiny. Also, he appears to have been a very hard person to depict in a positive light. He was not killed because of his involvement in the mutiny. I got the impression that if a true biopic was made about him, I would hate him. It seems the fact it was never rerun is most likely because of its inaccuracies rather than a conspiracy to hide the truth. I am not saying you should not praise it, I’m just saying that with my obsession with accuracy, I would have problems with it. I am not a right-wing apologist, but I also don’t think it is right to create a leftist hero out of a villain. You will find as many who will say it is true though. He isn’t portrayed as a hero at all and not even the one repsonsible for the mutiny in the series. He is shown as a cheater with a lot of charm who gets away with everyting because of his looks and manners. It’s actually interesting that he becomes the “leader” because he represents an officer although that is what they fought. What made the series controversial is the BullRing incident which, as such, has nothing to do with Toplis. No inaccurate portrayal of history did ever prevent something to be aired. Imagine, if that was a reason we would be back to 2 TV stations and one programme per day. Tops. 🙂 I didn’t say he was killed because of the mutiny. He was a con man, he had it coming anyway. @the war movie buff: actually, most western european anti-war films released beetween the 50s and the 80s were based upon Class conflict. Especially when set during WWI (Losey’s King and Country, Rosi’s Uomini contra, etc.). As artistic artefacts, all films are the products of their own historical contexts… for a european filmmaker in those days, the Great War was an almost perfect illustration that Class conflict did exist. Or at least, had existed in such a pure form, for precisely from the 50’s it would become more and more blurred in european societies. That’s the irony, I guess. Film or television dramas about mutinies (and more generally critical of the conduct of war by the military establishment) had been quite controversial in the UK and France in the sixties, but had practically ceased to be in the eighties. From what I read there was a huge political fight over the BBC at the time the series was aired, and advertising for ‘a true story’ turned out to be the straw that broke the camel’s back. It was shelved to make an example, a political point… at a certain time and place in History. You’re welcome. Controversy aside I still think it’s well done. Although a bit long in places. What is strange though, if there were political reasons at the time (which I don’t doubt), why has it still not been shown again? The political climate has changed. There must be more to the whole story than that. Well, the political climate only changed ten years later, and I’m not sure it did change that much with the ‘New Labour’… Also, with the multiplication of private channels, the idea of a public institution openly criticizing other public institutions didn’t seem, for better or worse, as relevant as before. That’s a Ken Loach I haven’t seen, thanks for mentioning it. Still seems odd that after all this time they didn’t show it again. I think McGann is a popular actor. Thanks Caroline: I’ve been looking at this one and wondering if I should rent it. Now I will. I could imagine you’d like it. Toplis is an interesting character. You will not be able to watch it in one go, it’s too long for that (and has a few lengths) but I think it’s more than just a character portrait, it’s a really disillusioned look at British officers and high command. By the way, have you heard/watched Parade’s End? it’s a war mini-series also from England and starring the handsome Benny. No, I hadn’t heard of it, thanks a lot. Just keep in mind The Monocled Mutineer is a bit slow in places.